The angel’s wing oyster mushroom (Pleurocybella porrigens, Sugihiratake) is a well-known delicacy. However, its potential risk in acute encephalopathy was recently revealed by a food poisoning incident. To disclose the genes underlying the accident and provide mechanistic insight, we seek to develop an information infrastructure containing omics data. In our previous work, we sequenced the genome and transcriptome using next-generation sequencing techniques. The next step in achieving our goal is to develop a web database to facilitate the efficient mining of large-scale omics data and identification of genes specifically expressed in the mushroom. This paper introduces a web database A-WINGS (http://bioinf.mind.meiji.ac.jp/a-wings/) that provides integrated genomic and transcriptomic information for the angel’s wing oyster mushroom. The database contains structure and functional annotations of transcripts and gene expressions. Functional annotations contain information on homologous sequences from NCBI nr and UniProt, Gene Ontology, and KEGG Orthology. Digital gene expression profiles were derived from RNA sequencing (RNA-seq) analysis in the fruiting bodies and mycelia. The omics information stored in the database is freely accessible through interactive and graphical interfaces by search functions that include ‘GO TREE VIEW’ browsing, keyword searches, and BLAST searches. The A-WINGS database will accelerate omics studies on specific aspects of the angel’s wing oyster mushroom and the family Tricholomataceae. The angel’s wing oyster mushroom (Pleurocybella porrigens, Sugihiratake in Japanese) belongs to the family Tricholomataceae. The genus Pleurocybella is monotypic, and contains only the angel’s wing oyster mushroom, which is widespread in temperate forests of the northern hemisphere . The fruiting body is widely recognized as a delicacy, and is consumed all over the world. Unexpectedly, in 2004, a total of 55 cases of food poisoning were reported due to consumption of the mushroom, with 17 of them ending in death due to acute encephalopathy. Despite an aggressive effort to identify the underlying cause of these events [3–11], the molecular basis remains obscure. To disclose the genes underlying the poisonings and provide mechanistic insight, we have sought to develop an information infrastructure containing omics data. In a previous study, we sequenced the genome and transcriptome of the mushroom using next-generation sequencing techniques . That study revealed that, compared to other Agaricales, the genome of the angel’s wing had a unique structure and contained numerous novel genes. Deep mRNA sequencing of the fruiting bodies and mycelia revealed the existence of 45,390 and 26,216 unigenes (non-redundant sequence sets for expressed genes), respectively. Based on the obtained sequences, we identified differentially expressed genes between the fruiting bodies and mycelia. Given this genomic and transcriptomic data, we believed that a web database would facilitate the efficient mining of the large-scale omics data and identification of genes specifically expressed in the mushroom. This study introduces the web database A-WINGS (http://bioinf.mind.meiji.ac.jp/a-wings/), which provides integrated genomic and transcriptomic information on the angel’s wing oyster mushroom. The database contains structure and functional annotations of transcripts and gene expressions. 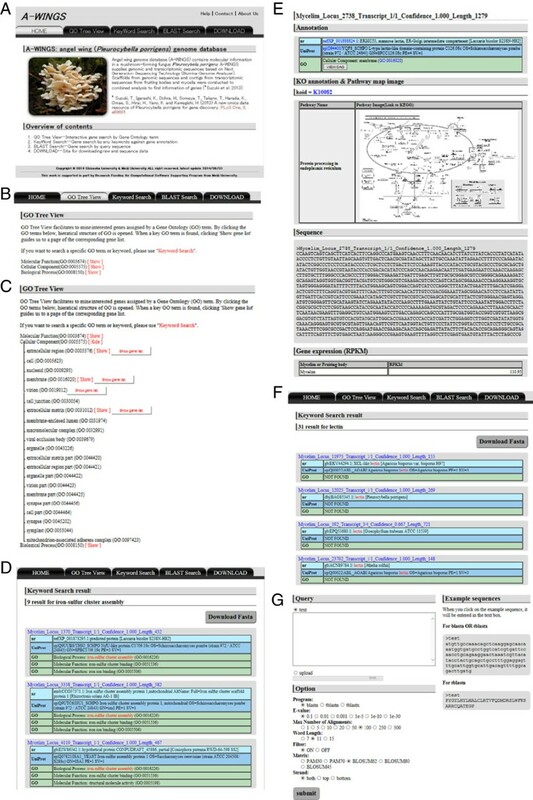 The functional annotations include information on: (i) homologous sequences detected by BLAST sequence similarity searches  against the non-redundant protein database (nr) in the NCBI  and universal protein knowledgebase (UniProt) ; (ii) Gene Ontology (GO) terms  obtained by InterProScan ; and (iii) KEGG Orthology . Digital gene expression profiles were derived from RNA sequencing (RNA-seq) analysis in the fruiting bodies and mycelia, respectively. The omics information stored in the database is freely accessible through interactive and graphical interfaces by search functions including ‘GO Tree View’ browsing, keyword search, and BLAST search. A-WINGS was developed by the LAMP (Linux, Apache, MySQL and Perl) stack. We stored omics data of the angel's wing  into MySQL database (version 5.0.95) on an Apache HTTP server (version 2.2.27) running on a Linux operating system (CentOS release 5.11, 64-bit). We then developed an interactive and graphical web-interface written in PHP and HTML for the data access. The database was equipped with three search functions—Keyword Search, GO Tree View and BLAST Search—provided by tab-based interfaces on the web page (Figures 1 and 2A). The database structure of A-WINGS. The omics data are accessible through the search functions in tab-based interfaces. The graphical, interactive web interfaces allow users seamless access to information available in A-WINGS. 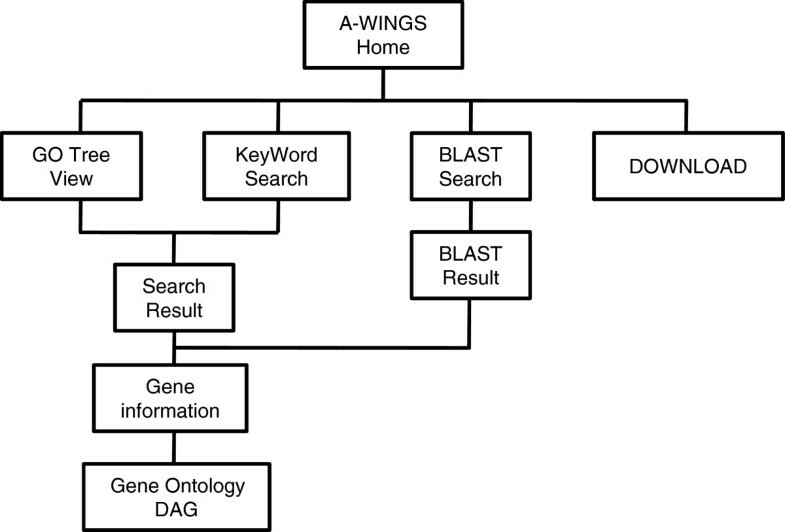 Graphical user interfaces of A-WINGS: (A) top (parent) page; (B) GO Tree View page; (C) GO Tree View page with ‘child’ GO terms; (D) the gene list associated with a GO term; (E) the detailed page for unigene (transcript information); (F) search results obtained by the keyword search function; (G) the BLAST search interface. The GO Tree View is an interactive and graphical viewer for effective browsing of Gene Ontology (GO) terms  and gene (unigene) lists. GO terms and GO identifiers are presented in directed acyclic graph (DAG) . When users access the GO Tree View, the top three categories (i.e., Cellular Component [GO:0003674], Biological Process [GO:0005575], and Molecular Function [GO:0008150]) appear in the viewer (Figure 2B). Clicking ‘parent’ GO terms with a broader sense, calls up ‘child’ terms with a narrower sense (more specialized terms) (Figure 2C). The gene list associated with a GO term is also accessible by clicking ‘Show gene list’ (Figure 2D). The list of genes (unigenes) includes information on unigene names and brief functional annotations. The functional annotations contain homologous sequences in the nr, UniProt, and GO terms. Clicking on the hyperlink of a unigene retrieves detailed information on the unigene (Figure 2E). In addition to the brief annotations, the detailed information page contains material on metabolic pathways from KEGG Orthology (KO) , the nucleotide sequences of the unigene, and the gene expression level (RPKM). KO identifiers, KEGG pathway names and images for the maps are shown with external links to the KEGG website. The graphical view of the directed acyclic graph for each GO term, provided in the database DAGViz , can be also retrieved by clicking the ‘VIEW DAG’ button in the table for brief annotations.With the ‘Keyword Search’ function, the information on unigenes can be retrieved by keyword searches against functional annotations. In the text box for keywords, users enter a keyword (e.g., lectin) or phrase (e.g., transcription factor). When they employ multiple keywords to search for unigenes, the search options for the Boolean operator ('AND Search' or 'OR Search') must be properly selected. The functional annotations obtained from three databases (nr, UniProt and GO terms) are employed by the default search function. Users can select the database (nr, UniProt and GO terms) to use for the search. As in the ‘GO Tree View’ described above, search results are shown on a gene list page with the query keyword(s) (Figure 2F). In a table, gene names are shown with brief functional annotations. The query keywords described in the brief annotations are highlighted in red font. A button ‘Download Fasta’ on the retrieved page provides the sequence data of the unigenes (Figure 2D, F). The ‘BLAST Search’ function provides information on unigenes by using sequence similarity searches. The BLAST program package (ver. 2.2.26), which incorporates BLASTN, TBLASTN and TBLASTX , was implemented into A-WINGS (Figure 2F). A nucleotide or amino acid sequence(s) can be used as a query sequence(s). A query sequence can be submitted by entering it into the query box or by uploading a FASTA formatted file. Users can also simultaneously submit multiple query sequences in the FASTA format. The following search options in the BLAST programs can be set in the interactive interface: the arbitrary threshold of E-value, maximum number of alignments, word length (which controls the sensitivity), filtering option (for masking highly repetitive sequences), score matrix, and strand. The ‘DOWNLOAD’ page provides hyperlinks for downloading files. It allows users to obtain raw data of genome sequencing reads, RNA-seq reads, unigene sequences (assembled sequences for transcriptome) and scaffolds obtained by assembling of genome sequencing reads . The A-WINGS database serves as a primary bioinformation portal for the angel’s wing oyster mushroom omic information; the portal can be accessed at http://bioinf.mind.meiji.ac.jp/a-wings/. A-WINGS facilitates the identification of expressed genes and their biological functions, as well as the analysis of the mushroom’s genomes and the family Tricholomataceae. The database will be maintained and updated with the additional omics data as they become available. The web interfaces will be also improved for easier handling and interpretation of large-scale omics data. For example, the genome browser GBrowse  will be integrated into A-WINGS to make it possible to explore genomic sequences and annotations. The continual updating of omics information will further the database’s contribution to fungal research. A-WINGS is freely available. All questions and comments should be sent via email to achkawa@ipc.shizuoka.ac.jp and kyano@isc.meiji.ac.jp. We welcome any constructive requests for implementing additional features into A-WINGS in the future. Naoki Yamamoto, Tomohiro Suzuki, Masaaki Kobayashi contributed equally to this work. This work was partially supported by a Grant-in-Aid for Research and Development Projects for Application in Promoting New Policy of Agriculture Forestry and Fisheries from MAFF, a Grant-in-Aid for Scientific Research on Innovative Areas “Chemical Biology of Natural Products” from Ministry of Education, Culture, Sports, Science and Technology (MEXT) (No. 24102513), and a Grant-in-Aid for Scientific Research (A) from the Japan Society for the Promotion of Science (JSPS) (No. 24248021) to H. Kawagishi. This work was also supported by a Grant-in-Aid for Scientific Research on Innovative Areas (No. 26113716) from JSPS, MEXT-Supported Program for the Strategic Research Foundation at Private Universities (2014–2018), and Research Funding for Computational Software Supporting Program from Meiji University to K. Yano. NY wrote the manuscript with TS’s assistance. TS, KY and KY developed the web interfaces, and NY assisted in its design and description. TS, YT, MK and YS prepared the data incorporated into the database. HK and KY were the principal investigators of the project. HD and HH supported this work. All authors read and approved the final manuscript.